Hot, sweaty and speckled with croutons, “Lebanon” is a claustrophobic nightmare about four woefully inexperienced Israeli soldiers trapped in a crippled tank on the opening day of the war with Lebanon. Cramped inside the tank are Shumlik (Yoav Donat), the gunner who suffers from whatever the opposite of an itchy trigger finger is; Yigal (Michael Moshonov), an unapologetic momma’s boy in the driver’s seat; Hertzel (Oshri Cohen), the borderline mutinous ammo loader; and Assi (Itay Tiran), the overmatched commander. Throughout their brief journey they are joined by a superior officer, a fallen comrade, a POW and a Phalangist. 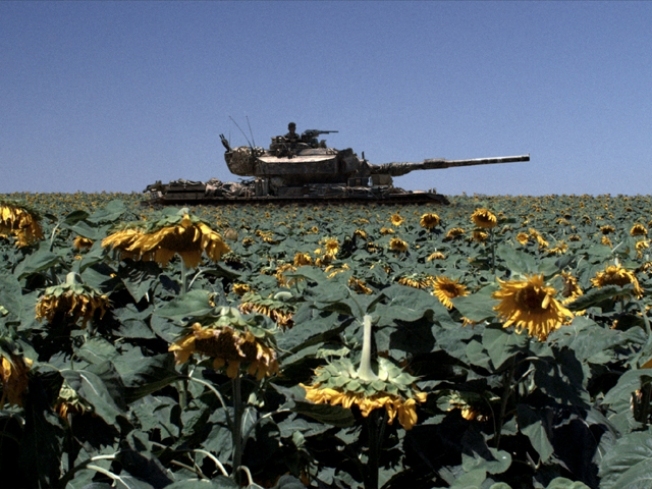 All the action takes place in the confines of their “Rhino,” which is escorting a dozen soldiers north through an urban area that’s already been bombed by Israeli figher jets. The only views of the outside world are seen through the gunner’s sight, a pair of crosshairs laid over everything, and each move of the ”eye” is accompanied a hydraulic whine. It’s supposed to be maddening, and it is. Samuel Moaz wrote and directed the film in part as a form of therapy to get past his own memories of fighting in the war. For his efforts his film won the top prize, the Golden Lion, at the 2009 Venice Film Festival. “Making ‘Lebanon’ and finally confronting what happened in that war, has given me my true feelings back and I can cry real tears once more," Moaz said at the time of his film’s victory. That Moaz managed to keep finding new corners of the tank to plant his camera is a minor miracle. But it’s the view through the gunner’s site that truly drives home the horror of war, as an unblinking eye stares emotionlessly at a weeping, half-naked mother or a mortally wounded solider. “Lebanon” is a suffocating and tense debut feature film that conveys all too well the the fear that comes with being stranded in a war zone, and the different ways in which the human psyche fights to survive.